Dozens of elderly South Koreans crossed the heavily fortified border into North Korea on Monday for heart-wrenching meetings with relatives most haven't seen since they were separated by the turmoil of the Korean War. The weeklong event at North Korea's Diamond Mountain resort comes as the rival Koreas boost reconciliation efforts amid a diplomatic push to resolve a standoff over North Korea's drive for a nuclear weapons program that can reliably target the continental United States. The temporary reunions are highly emotional because most participants are elderly people eager to see their loved ones once more before they die. Most of their families were driven apart during the 1950-53 Korean War, which ended in a ceasefire, not a peace treaty, leaving the Korean Peninsula still in a technical state of war. [post_ads]Buses carrying about 90 elderly South Koreans and their family members were moving into the Diamond Mountain resort after crossing into North Korea. 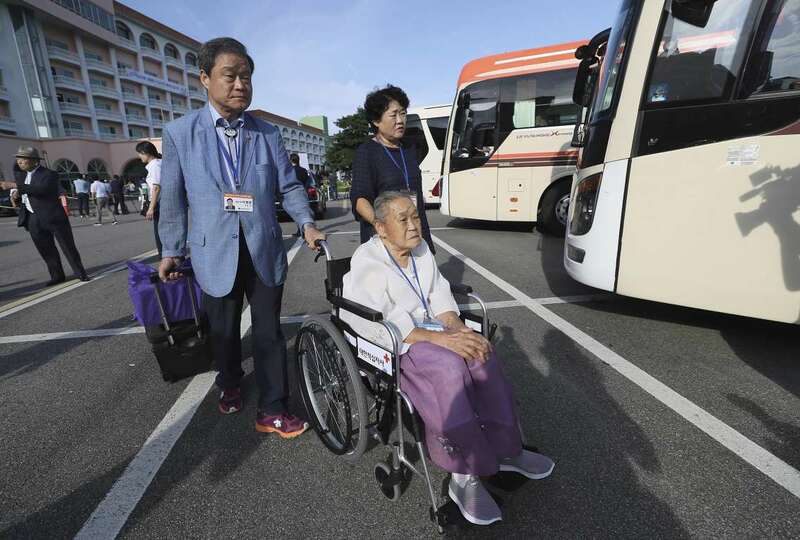 Earlier in the morning, the South Koreans, some in wheelchairs and aided by Red Cross workers, had left the buses briefly to enter the South Korean immigration office in the eastern border town of Goseong. They were to reunite with their long-lost North Korean relatives on Monday afternoon at the start of a three-day reunion. A separate round of reunions from Friday to Sunday will involve more than 300 other South Koreans, according to Seoul's Unification Ministry. Past reunions have produced powerful images of elderly Koreans crying, embracing and caressing each other. Nearly 20,000 people have participated in 20 rounds of face-to-face reunions since 2000. Another 3,700 exchanged video messages with their North Korean relatives under a short-lived communication program from 2005 to 2007. No one has had a second chance to see their relatives. Many of the South Korean participants are war refugees born in North Korea who will be meeting their siblings or the infant children they left behind, many of them now into their 70s. Park Hong-seo, an 88-year-old Korean War veteran from the southern city of Daegu, said he always wondered whether he'd faced his older brother in battle. After graduating from a Seoul university, Park's brother settled in the North Korean coastal town of Wonsan as a dentist in 1946. After the war broke out, Park was told by a co-worker that his brother refused to flee to the South because he had a family in the North and was a surgeon in the North Korean army. Park fought for the South as a student soldier and was among the allied troops who took over Wonsan in October 1950. The U.S.-led forces advanced farther north in the following weeks before being driven back by a mass of Chinese forces after Beijing intervened in the conflict. Park learned that his brother died in 1984. At Diamond Mountain, he will meet his North Korean nephew and niece, who are 74 and 69, respectively. "I want to ask them what his dying wish was and what he said about me," Park said in a telephone interview last week. "I wonder whether there's a chance he saw me when I was in Wonsan." During the three years since the reunions were last held, the North tested three nuclear weapons and multiple missiles that demonstrated they potentially could strike the continental United States. North Korea has shifted to diplomacy in recent months. Leader Kim Jong Un and South Korean President Moon Jae-in, a son of North Korean war refugees, agreed to resume the reunions during the first of their two summits this year in April. South Korea sees the separated families as the largest humanitarian issue created by the war, which killed and injured millions and cemented the division of the Korean Peninsula into the North and South. The ministry estimates there are currently about 600,000 to 700,000 South Koreans with immediate or extended relatives in North Korea. But Seoul has failed to persuade Pyongyang to accept its long-standing call for more frequent reunions with more participants. The limited number of reunions cannot meet the demands of divided family members, who are now mostly in their 80s and 90s, South Korean officials say. More than 75,000 of the 132,000 South Koreans who have applied to participate in reunions have died, according to the Seoul ministry. Analysts say North Korea sees the reunions as an important bargaining chip and doesn't want them expanded because they give its people better awareness of the outside world. While South Korea uses a computerized lottery to pick participants for the reunions, North Korea is believed to choose based on loyalty to its authoritarian leadership. Chang reported from Goseong, South Korea. AP writer Hyung-jin Kim in Seoul contributed to this report.